← Siri take the wheel. Digital life hacking for dummies. From Vimeo to Periscope. Do we really need another video app? First, there was Vimeo, the first video sharing website. Vimeo allowed users to upload, share and search for videos online, and life was good. YouTube gave us our fill of all the videos we could no longer see on cable or broadcast TV, all with a quick search. Vevo popped up after that. Vevo was a great alternative to YouTube because it had higher quality videos, without all the associated riffraff of user generated content. Suddenly UStream appeared, and not only could you watch video replays, but you could tap into live video streams. Couldn’t be there, but want to experience it live? UStream let you do just that. We had achieved video Nirvana. Not to be left out of the fray, Facebook offered its own native video player, giving its millions of users an easy way to upload and share videos on its platform. All of your low res, hi def, canned or live streaming video options were covered. Because then came SnapChat with it’s expiring videos. And then Meerkat, the app that lets you broadcast yourself doing whatever to whoever wants to tune in. And finally (and I say “finally” loosely) Periscope, which let you do the same thing. So, what’s with all the video apps and services? Well, video is a big thing. No, I’m not talking about the bandwidth it requires. I’m talking about the appetite folks have for it. And they money that can be made. Instagram has added video, so that its not just still photos anymore. YouTube now offers “premium” channels. Content companies, like HBO, are cutting ties with Cable companies and offering their content directly to consumers through apps and consoles. Netflix and Hulu let you watch television and movies on the go. Virtually everywhere you look – elevators, cabs, subways, planes, trains – video is offered. And regular people are getting in on the action. Shooting a video of a melee and yelling “WorldStar!” is a thing. People try to make “viral” videos as a way of getting their 15 minutes. Folks earn bookoo bucks as YouTube broadcasters, creating often funny, niche content, attracting tens of thousands of viewers, and earning income as well. Buzzfeed, FunnyOrDie, College Humor and many others’ business models are built exclusively off producing and marketing video content. So while I think the current ‘fight’ between the creators of apps like Periscope and Meerkat is stupid, because…well just because, there is clearly an insatiable appetite for virtually any kind of video. Have you ever watched a sensory video – the kind that’s supposed to give you tingles just by watching? Are Meerkat or Periscope the last of the video apps we’ve seen? No. Not by a long shot. 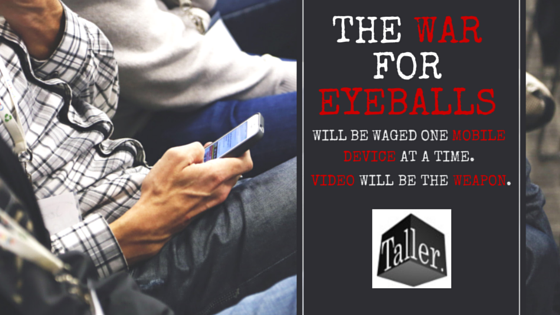 There’s a war for eyeballs currently being waged. With billions of dollars to be made. And folks out here seeking fame by turning their cameras on and streaming themselves doing whatever. And with all of our shiny, powerful, always-on mobile devices clutched in our collective sweaty palms, we’re all in the crosshairs.